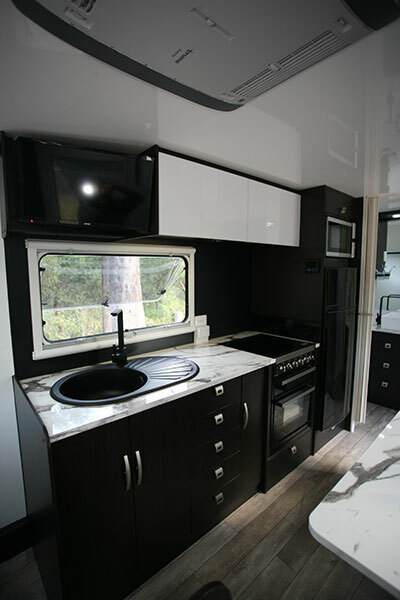 AUSRV is quite a new name in the Australian caravan manufacturing industry. However, its parent company – Market Direct Campers (MDC) – is not. 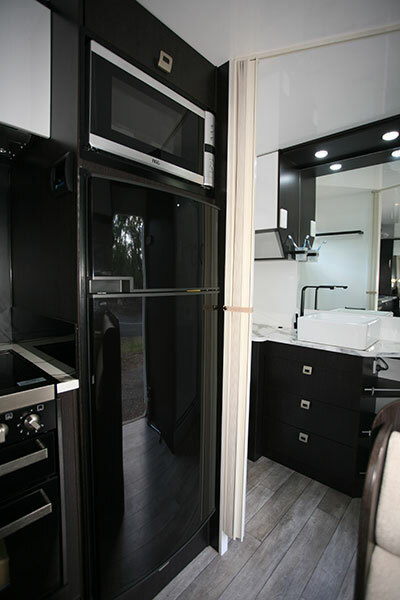 Until now, MDC has been best known for its imported camper trailers and offroad hybrids. 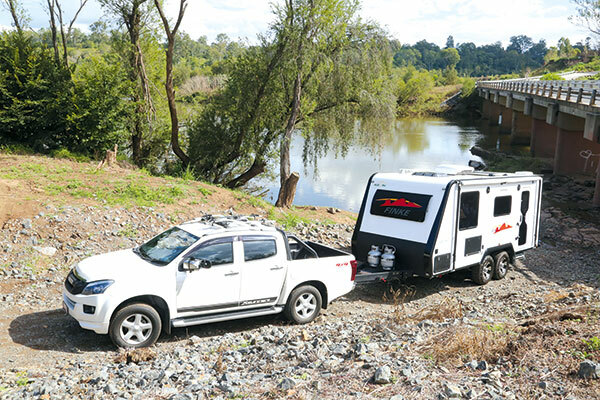 But now, AUSRV, under MDC, has set up a local production facility at its Coopers Plains, Qld, factory, for a new range of all-terrain and full offroad caravans. 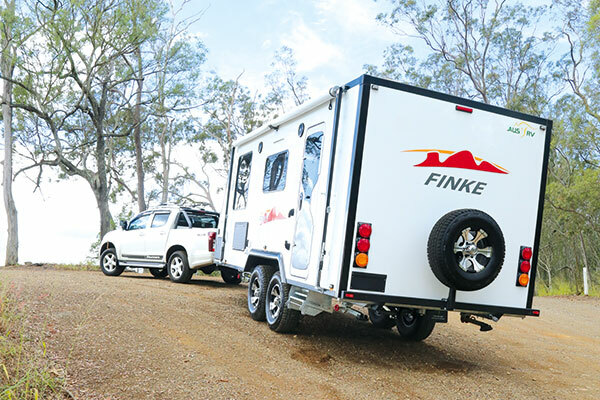 We picked up a new Finke 19-02 AT caravan for this review. The Finke 19 is a 5.87m (19ft 3in) tandem axle van designed for all-terrain use. 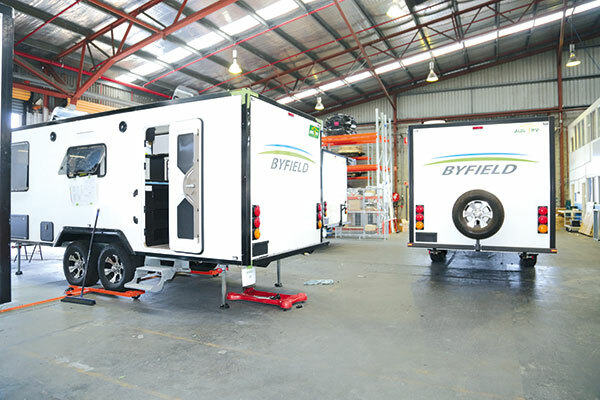 There are three Finke models on the market, forward door entry, rear door and bunk van. 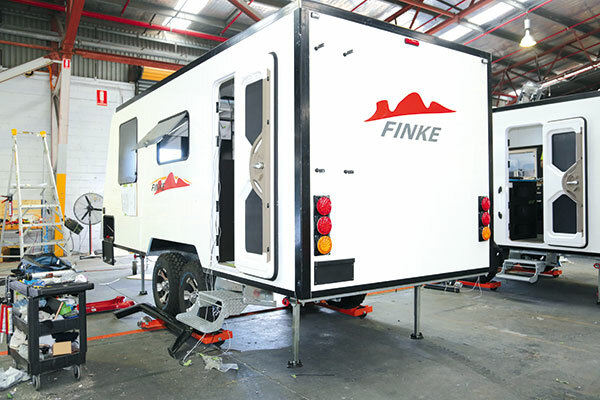 The Finke 19 has a Tare weight of 2141kg and an ATM of 2900kg which gives it a substantial payload of 759kg. You could also, potentially, go easy on your loading and stick under the 2500kg ‘Prado-friendly’ limit to increase your choice of tow vehicle. However, it is also well suited to a larger ute like the Isuzu D-Max that I towed it with. The unladen tow ball weight, at 98kg, is surprisingly light for a van of this size! The Finke’s hot-dipped galvanised chassis suggests that AUSRV has done some work paring down the weight of this van. 150x50mm (6x4in) RHS is used for the main rails and drawbar, but a punched hole C-section is used for the few cross members rather than the more common 50mm (2in square) version. Instead of steel, the one piece composite floor is used to improve the strength without adding extra weight. AL-KO Enduro independent suspension, fitted with coil springs and shock absorbers, rides on the tandem axles. The body doesn’t have a frame; instead, the fibreglass composite walls and roof do much of the same job as the floor. And it’s worth noting that AUSRV has resisted the temptation to clad the van in popular alloy checkerplate, instead using a spray-on stone shielding on the lower front wall. The Finke 19 is reasonably well setup for off-grid travels with a single 100Ah house battery, 200W solar panel and a Redarc battery management system. The two 9kg gas cylinders will keep the three-way fridge going without causing the battery too much stress. The Finke’s front bedroom/rear bathroom layout looks familiar but, at the same time, the interior is refreshingly different due to the cabinetry and colours used. The dark cabinetry and walls might not be my personal preference but I understand a lighter hue is also available so the choice is yours. Either way, interior brightness won’t be a huge issue because the window area of this van is impressive! Up front, the island bed is surrounded by windows and a huge Ranger marine-style skylight with LEDs in the roof above so good airflow will not be a problem. I really liked the large bedside compartments under the wardrobes and these nice little hidey holes come complete with powerpoints. 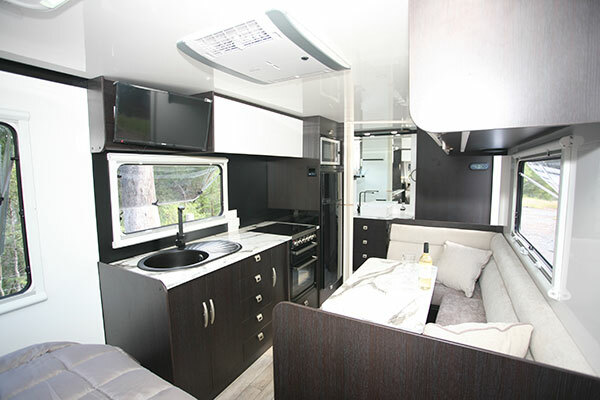 Between the entry door and the front bedroom, the dinette is quite comfortable for two but the narrow seat along the wall is more for putting your feet up, rather than sitting for a long period. Facing the dinette, the kitchen bench is larger than it looks. It comes with all the cooking and washing up gear we have come to expect but there’s a bit more cupboard and benchtop space than usual. This brings us to the bathroom across the rear of the van. 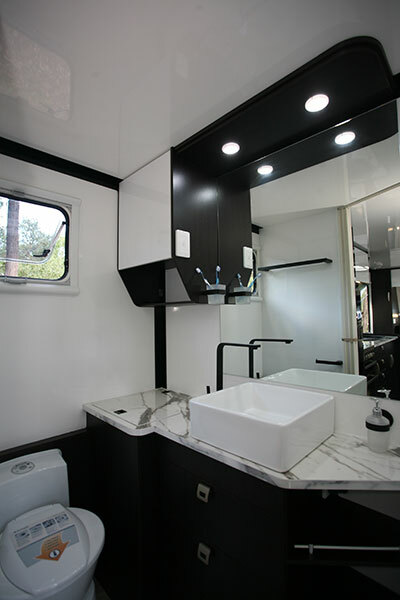 It has a good-sized shower cubicle but extra space around the Dometic cassette toilet and vanity cabinet. There is also a set of drawers and room for the top-loading NCE washing machine. 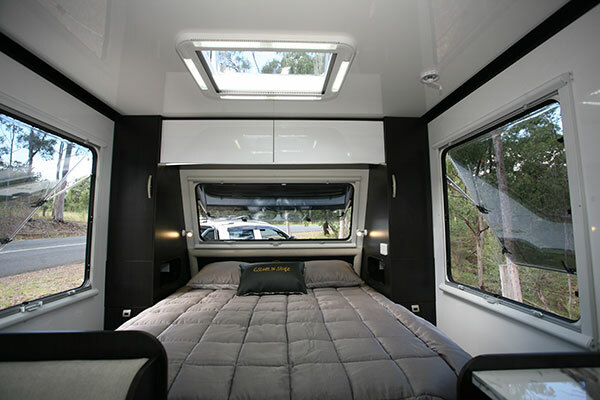 I was excited to see the AUSRV Finke, as I am to see a new caravan manufacturer trying something a bit different. And MDC’s camper trailer heritage made me even more curious! It’s clear AUSRV hasn’t just set out to do what everyone else is doing. 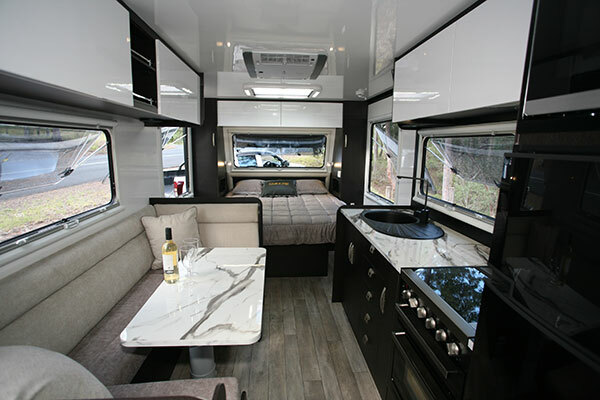 Even though the van has what is a pretty standard interior layout, there are many noticeable differences in its general appearance, and the obvious effort AUSRV has put into getting the weight down is sure to find favour with smaller tow vehicle owners. It’s an excellent start, in my opinion.